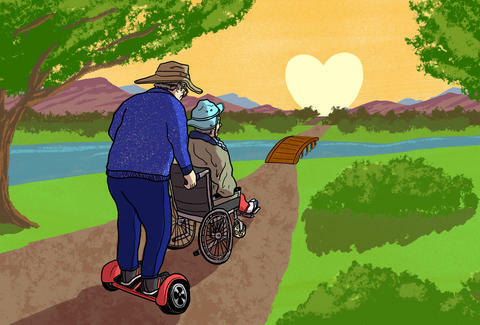 "In sickness and in health" is given lip service at every wedding, but here's a couple that actually walks the walk -- or... hoverboards the walk, as it were. John and Judy Anderson have been together for nearly 60 years. They met in 1958, obviously a very long time before the hoverboard was invented, but little did they know it would become an important daily fixture in their relationship. Anyone who's ever helped their grandmother set up her email knows that new technology can be intimidating for seniors. I mean, I'm in my 30s, and the first time I saw a hoverboard I thought, "What the hell is this garbage?" But here's the story of a 78-year-old man who saw one and thought, "Yeah, I'll ride one. And I'll take my wife along with me." I first spotted John Anderson and his 76-year-old wife, Judy, when I was driving outside of Denver, CO, near a retirement village where seniors take brisk afternoon walks when it's nice out. To say the least, they've kicked their walks up a notch: John pushes Judy's wheelchair while he rides on a hoverboard at 5mph. I asked John if he would share their story with me, and he happily obliged. He met Judy in tiny Potsdam, New York -- John was attending Clarkson University, and Judy was studying to be a teacher at SUNY Potsdam. (Go Fighting... Dams?) John joined the Army and they bounced around the world, to DC to Turkey to Germany, and finally settled in Colorado in December 1989. They have two kids, and they've been in a relationship for nearly 60 years. To put that in perspective, that's about 54 years longer than Kim and Kanye. In 2003, Judy was diagnosed with Parkinson's. She is currently in skilled nursing care near the retirement village, and John comes to visit Judy often. That's when they go for their very special walks. When I asked them how their relationship has changed over time, John said, "You get used to one another." Judy offered, "You have to have love and…" "Patience?" I asked. "Yes." For a woman who lets herself be slowly rocketed around by a hoverboard, I'd say she's the model of patience. And I don't think John will be mad at me for writing this: he's not a spring chicken anymore. Watching him, uh, hover Judy around is simultaneously one of the sweetest and most bizarre things I've ever seen. When John first saw a Segway, he knew he wanted to try one, but never got the chance. Then he saw a report on the NBC affiliate in Denver about a local guy selling hoverboards, and bought one just for the hell of it. I asked him if he fell 40 times after buying it. He laughed. "No, I didn't fall 40 times, but I was scared 40 times," he said. John explained that he'd practice on his hoverboard with a ski pole or a walking stick, and then eventually got to the point that he didn't need either. I have a feeling that his past as a skier and a hockey goalie likely helped him. He realized the hoverboard could make a great motor for Judy's wheelchair. I asked Judy how she first felt about the idea. Was she scared? "Not really. I didn't know what I was in for!" she replied. I guess when you're with someone for that long, you begin to trust them. Weird. But John tells me he doesn't take the hoverboard to an unsafe speed. He goes about 4-5mph, which is faster than you can walk, as evidenced by the fact that I had to jog a bit to keep up with them on the video. The hoverboard is a newer feature in their decades-long relationship, but considering they've traveled the world together, raised two kids, and managed to stay together through it all, it's just the icing on the cake of their lifelong story. What really struck me about these two ultimately wasn't the novelty of seeing an old man cruising around on a hoverboard. People generally have a pretty negative view of hoverboards, but here's a 78-year-old man who's found a way to embrace modern technology and use it to improve the time he has with his wife. Equally impressive, if not more, she's totally cool with it. Maybe it's because I grew up in an age where everyone's parents were getting divorced, but it's pretty heartwarming that this guy is still by his wife's side. This is a relationship and a love that has adapted over time -- to disease, to the aging process, and to new technology. But also... it's an old guy cruising around on a hoverboard! Seriously, look at that dude go! Lee Breslouer is a senior writer for Thrillist, and is scared to ride a hoverboard. Follow him to safety: @LeeBreslouer.